BA, 2005, Wright State U.
MA, 2008, Wright State U.
MLIS, 2011, Wayne State U. Note: This article is not intended as a history of the Squirrel Hunters but as a framework for sharing the stories of two particular Squirrel Hunters from Dayton, Ohio: Howard Forrer and Eugene Parrott. For more general history of this episode, check out Panic on the Ohio! from Blue & Gray Magazine (Apr/May 1986). On September 1, 1862—the same day that Howard Forrer reluctantly returned to teaching a classroom full of students at the Second District School after his efforts to join the army had so far failed—a meeting was called at Dayton’s Armory Hall to discuss the city’s defense needs, in light of recent intelligence that a portion of Kirby Smith’s army under Brig. Gen. Henry Heth was advancing through northern Kentucky to threaten Ohio, following a victory at Richmond, Kentucky. Our southern border is threatened with invasion. I have therefore to recommend that all the loyal men of your counties at once form themselves into military companies and regiments to beat back the enemy at any and all points he may attempt to invade our State. Gather up all the arms in the country, and furnish yourselves with ammunition for the same. The service will be but a few days. The soil of Ohio must not be invaded by the enemies of our glorious government. Howard goes to Camp Dayton this morning to take the place of Adjutant. 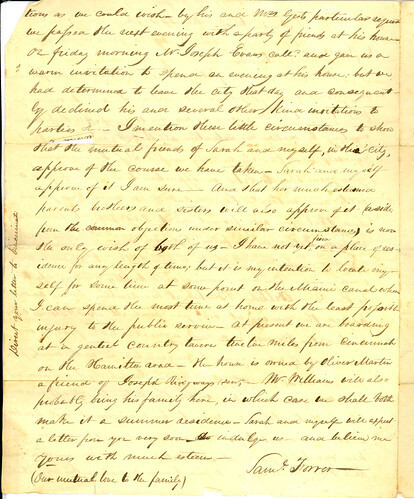 I do not know whether it is anything that will last long, but he is resolved at all [illegible] to go from the school… Howard goes to Columbus tonight with a recommendation from Col. [Tr.?] to the Gov, for the place of Post Adjutant. He may not [receive?] it, and may not keep it long if he does. It is uncertain whether there will be a Military Post there long. But Howard thinks it would be a stepping stone to something else perhaps the Adjutancy of the 112th. …it is very hard for me to feel willing to give up my only son, even for the defence of the country… He feels so injured by my continual opposition to his wishes that I must be silent… I suppose it is too much to ask of a young man of spirit to sit in the house and teach, in these stirring times, when most of his friends are in the field. Our city has been in a state of great excitement today. All the stores were closed at 4 P.M. & every body turned out to form ward companies & drill, a disorganized mess that would be little value as soldiers I think for a long time but it was encouraging to see the willing spirit manifested by such a wholesale turn-out. The news is better this eve’g; it is even said that Kirby Smith is south of the Ky river, & the story of his advance on Cin was only invented in order to have the city entrenched & fortified as it ought to be. Samuel Forrer was then 69 years old, so it was probably well that his wife forbade him to join the Squirrel Hunters! The enemy is reported today 16 miles fr Cinti & nearly every young man in town went down tonight with a gun. I have this afternoon endured agony in yieldg to my father’s entreats, but I cannot stay, my country calls, tomorrow I go. Yesterday [Sept. 4] and today [Sept. 5] the troops and farmers, mostly the latter, pass by carloads, and many thousands have gone down. Part of a regiment in CampDaytonleft. Howard went as adjutant. I scarce allowed myself to think he was going, but made ready for him with as little delay as possible. After he was gone and evening came on I was quite exhausted. All were out and gone home, and I sat alone on the little back porch to rest my weary self. But I dared not think of Howard. Eugene Parrott was among the many Daytonians, including Howard Forrer, who headed to Cincinnati on September 5, to join a force of about several thousand so-called Squirrel Hunters. Left home after a hasty tea armed & equipped, a soldier of the Union. As soon as I got away & felt I was certainly going I felt I was in the right course, pursuing my highest duty. Our train got off amid the cheers of the people, at 8 P.M.; reported at Chamber of Commerce at midnight; were marched to 5th St. market space for supper, & returning turned in on the floor at 3 o’clock. At 5 A.M. having got about an hour & a half’s sleep there was a noise commenced enough to awake the seven sleepers, so rose feeling pretty well on short rest. Breakfasted at Burnet with Charlie Clegg. Everybody said the call was a ‘hum,’ so got a discharge, but heard about dinner the attack was about to commence, so reported again at Mer Exch. My company had been ordered off so I fell in with a Dayton squad and we were detailed for Harrison’s Body Guard, & ordered to North Bend, where the enemy was expected to cross the river. Didn’t get a train till six P.M. Got to North Bend& found no enemy, apparently a false alarm. [Illegible] tonight by the river side. Rose at 5 A.M. quite refreshed by my first night’s sleep on the ground. [Illegible] out with part of the squad foraging for breakfast. Fared pretty well at the Thirteen Mile House. We went into camp today on our regimental parade ground, which is on Gen Harrison’s homestead, just in front of where his house stood. There was board yard here on the river which the men used for putting up very comfortable quarters. Rose at 6 A.M. after a broken night’s rest—waked up at midnight by mosquitoes & kept up by the fun of the [squad?] until 2, then on guard until 4. The Guard made a forced march onCleves, about a mile distant where we had ordered breakfast, & a good one we got from mine host Kennedy. The impression seems to be that the danger is about over now, & as my business is too imperative to admit of my staying to play soldier I got a pass fromCol.Harrison & leftNorth Bendat 2:50 P.M. Reached home at 8, went to the office & looked over the business. Home at Ten. Our Guard was ordered down to the river on a scouting expedition this morning—going down on one of the river gun boats, & taking a [train?] intoKentucky, the enemy’s country. When we got orders, Young & I who were going home, determined to go on the scout, even if we missed our train, but having to go back to camp after my ammunition, from Hd Qrs, I found on my return our Guard was about a quarter of a mile down the river, I went after them ‘double quick,’ but when I got within about a hundred yards of the boat she shoved off, leaving me very much discomfited. Last night about 5 o’clock, it was telegraphed to Hd. Qrs. from CampTippecanoe, 5 miles below here, that the enemy was in sight, & for a short time, we confidently expected a fight. We were ordered under arms ready to march, & supplied with ammunition. The Col.went down to see about the matters & returning in a few hours informed us that it was a party of our own men who had been foraging in Ky & were returning, which caused the alarm. Our boys seemed quite cool at the prospect of a fight, for myself I felt no apprehension, for I knew I had come out to fight & led by high & conscientious motives & if I fell it would be in a sacred cause. My greatest anxiety was for father, who I knew would sorely miss me in the business if I should fall. Busy in the office part of the day, the other part fighting my battles (?) o’er on the street & telling about that ‘gay & festiverous’ corps, the ‘Body Guard.’ Slept at Aunt Margaret’s tonight, the family wanting a protector during Charlie’s absence. Another alarm from Cinti today. The Governor calls all the minute men back. As soon as we got the news I came home & got ready to go back, feeling if there should be a fight, I ought by all means to be with my company. We had a dispatch the eve from Joe, say’g that the enemy was in sight & they expected to hear their guns every minute, but having had some experience in Cinti scares, & not being in a condition to leave home except in a great emergency, I concluded to wait until tomorrow. I woke this morning uncertain whether I ought to go back to North Bend or not, but Munger & Joe Peirce came into the office about eleven o’clock, & said they would go if I would, & not feeling willing to keep three men from the field when possibly we were much needed I consented to go. Left at 4 P.M. with Peirce & Brit Darst. Munger couldn’t get ready. Reached Ludlow about six, & got off intending to go across the country to the river, & thereby avoid red tape in Cin, as we feared if a fight was in progress we should have difficulty in getting out on the O&M Rd. Couldn’t get a horse for love or money, & couldn’t learn that there was any road except through Cin, so we laid around until the next down train, nearly midnight. Darst and I took possession of a bench at the depot with our knapsacks for pillows, got two or three hours of very comfortable sleep. Went to bed at the Burnet House at 1:30 A.M.
Rose at 4 & took the 5 o’clock train for Camp Harrison. The morning papers say that Kirby Smith was last night reinforced by 10,000 of Bragg’s troops & there will certainly be a great battle today. Got to camp in time to go with the ‘Guard’ for one of Kennedy’s good breakfasts. Fell easily into the routine of camp life, slept, smoked, eat, & speculated on the approach of the enemy. Our scouts inform us there were 300 rebel cavalry last night at FrancisvilleKy.2 miles only from our Hd. Qrs., but they don’t show themselves on the river. The news comes to us from Cin that Smith is retreating this afternoon, & Col.Harrison talks of taking his Brig tomorrow across the river, to hang on the enemy’s rear & pick up stragglers. …whether Kirby Smith’s soldiers would have been as easily brought down at the crack of their [the Squirrel Hunters’] rifles and shot-guns as squirrels had frequently been on previous occasions, was never demonstrated, as they [the Confederates] retreated southward without testing the valor of the Squirrel Hunters. Today we end our bloodless campaign. The Cin papers & the Gov’s proclamation say the danger is over & the minute men will be discharged. Tho’ we have done nothing in the way of fighting, we came with willing hearts to do it, & probably after all it is the militia have saved Cin. The hosts of them that lined the banks of the Ohiowould have made the crossing of the river a very severe undertaking. It has been a glorious sight to see; almost worth a man’s life time, the great outpouring of the citizen soldiery, politicians & legislators in the ranks, & stout yeomanry from all quarters of the state with their squirrel rifles & blankets over their shoulders have been pouring into Cin by thousands & tens of thousands. It has not been so seen since Bunker Hill. Got home at eight o’clock—found a crowd at the depot & as much fuss made over us as if we were really blood stained heroes. Unfortunately, Sarah did not get her wish. Sarah Forrer to Mary Forrer, 3 Sept. 1862, Forrer-Peirce-Wood Collection (hereafter cited as FPW), 4:5, Dayton Metro Library, Dayton, Ohio. History of Dayton, Ohio (Dayton, OH: United Brethren Publishing House, 1889), 296; David E. Roth, “Squirrel Hunters to the Rescue,” Blue and Gray Magazine 3, no 5 (Apr./May 1986), http://www.cincinnaticwrt.org/data/ohio%20in%20the%20war/1862%20Defense%20of%20Cincinnati/iii_squirrel.pdf. History of Dayton, Ohio, 296. David Tod, 2 Sept. 1862, quoted in Roth. H. Eugene Parrott’s diary, 2 Sept. 1862, FPW, 31:1. Sarah Forrer’s diary, [2 Sept. 1862], quoted in Frances I. Parrott, “Sons and Mothers,” [undated], FPW, 32:4. Sarah Forrer to Mary Forrer, 3 Sept. 1862, FPW, 4:5. Sarah Forrer’s diary, [3 Sept. 1862], quoted in F. I. Parrott, FPW, 32:4. H. Eugene Parrott’s diary, 3 Sept. 1862, FPW, 31:1. History of Dayton, Ohio, 297. Sarah Forrer’s diary, 5 Sept. 1862, quoted in F. I. Parrott, FPW, 32:4. Sarah Forrer to Mary Forrer and Augusta Bruen, 7 Sept. 1862, FPW, 4:5. H. Eugene Parrott’s diary, 4 Sept. 1862, FPW, 31:1. Sarah Forrer’s diary, 7 Sept. 1862, quoted in F. I. Parrott, FPW, 32:4. Sarah Forrer’s diary, [?] Sept. 1862, quoted in F. I. Parrott, FPW, 32:4. H. Eugene Parrott’s diary, 5 Sept. 1862, FPW, 31:1. H. Eugene Parrott’s diary, 6 Sept. 1862, FPW, 31:1. H. Eugene Parrott’s diary, 7 Sept. 1862, FPW, 31:1. H. Eugene Parrott’s diary, 8 Sept. 1862, FPW, 31:1. Sarah Forrer to Mary Forrer and Augusta Bruen, 10 Sept. 1862, FPW, 4:5. H. Eugene Parrott’s diary, 9 Sept. 1862, FPW, 31:1. H. Eugene Parrott’s diary, 10 Sept. 1862, FPW, 31:1. H. Eugene Parrott’s diary, 11 Sept. 1862, FPW, 31:1. H. Eugene Parrott’s diary, 12 Sept. 1862, FPW, 31:1. H. Eugene Parrott’s diary, 13 Sept. 1862, FPW, 31:1. Howard Forrer to Elizabeth (Forrer) Peirce, 16 Sept. 1862, FPW, 6:8. Sarah Forrer to Mary Forrer and Augusta Bruen, 21 Sept. 1862, FPW, 4:5. I’m on the trail of Samuel Forrer and Sarah Howard again. As I was first delving into their story, I wondered what Sarah was even doing in Cincinnati (where she met Samuel in 1825), when her family lived near Columbus. I discovered that Sarah was apparently attending school there [see Part 4, Aug. 14, 2011]. , and the two seem to have met through a mutual friend, Micajah T. Williams. Forrer, a canal engineer for the Miami and Erie Canal (the construction of which had begun in that year), knew Williams by his association with the canal (Williams was one of the canal commissioners for the Miami and Erie canal). Sarah apparently spent some time with the M. T. Williams family (possibly even stayed with them while she was in Cincinnati), because Williams knew her father (both were Quakers who at one time attended the same monthly meeting, unclear whether there was another connection). She may have also been staying with Joseph Gest, by whose care her father’s 1825 letters were sent. Based on the apparently frequent involvement of these men in Sarah’s life during that time period, I supposed that her school was probably nearby (and as I said, that perhaps she might have been boarding with one family or the other). As this is really a matter of intellectual curiosity only, I decided I must be content to come up with an “educated guess” about where Sarah was attending school, since I could not find any reference to the school by name in either of Horton’s two letters to his daughter from the Fall of 1825, which seems to have been when Sarah enrolled there (wherever “there” was). …Thou may remember that our friend Joseph Gest mentioned a probability of there being an opportunity of thy attending a course of Lectures on Chymistry [sic] and I should think well of thy doing so if it will not break in too much on thy other studies, which I think perhaps it would not. I wish thee to be particular in endeavouring to learn the art of painting or shading maps in as neat a manner as thou canst without spending too much time and learn what thou canst conveniently about making or mixing such colours as are not to be bought in Boxes as we shall probably want to paint or shade a considerable number of maps neatly if we can find [sale?] for them. The calculation we were making that 30 dollars would answer to leave with thee at present included the cost of thy Cloak but as I bought and paid for the cloth to make it, and left thee thirty dollars, besides though wilt not be so short by ten dollars as we calculated and want thee to get what thou needs and not be too sparing of money but continued to be and appear respectable. If thou needs any advice with regard to Books or other things thou art not furnished with or with respect to learning or hearing Lectures or any other subject Joseph Gest or Micajah [Williams] or other friends will advise thee. Joseph will aid or befriend thee very Cheerfully and so no doubt will other friends. Thou may by inquiry perhaps understand nearly how long it would require to learn the French Language or the Lattin [sic] or both, if it should be desirable and advisable. Possibly we might spare thee longer than we had contemplated but as this is uncertain I wish thee to acquire what useful knowledge thou canst in three months or till spring. I now think of thy staying 6 months or until some time in the 5th month if I can but this is uncertain. I intend however that some of us shall write [over?] in two weeks and expect thee to write twice a month or oftener if necessary or thou thinks proper. And if thou should be sick don’t by any means suffer of want of a Phisitian [sic] but have one sent for and I will cheerfully pay the cost when I come. 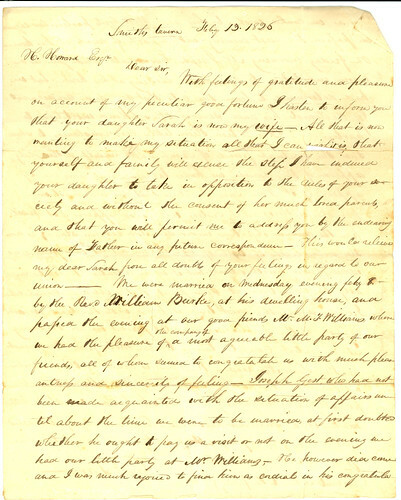 This letter was written 186 years ago, but still I can see familiar sentiments as today’s parent writing to a child away at school: here are my thoughts on your curriculum; try not to over-extend yourself with your course load; I’ve sent you some clothes money; if you get sick, please do see a doctor, and I’ll pay for it. Armed with the clues from the above letter (the other 1825 letter does not give any clues about education but hints at her parents’ knowledge of her “extracurricular” activities – more on that later) and an idea of the geographic neighborhood where Sarah seemed to spend most of her time, I set out to find out if there was a school she might have attended in that area. In 1825, Sarah was 18 years old, so I figured I was probably looking for some kind of “college” level school. Also, given the time period, I guessed that she was probably attending some sort of “female” school. The term, ‘higher education for women,’ in those early years…was higher in the sense of giving young women an education much beyond the common branches of reading, writing, and arithmetic. It differed from the colleges for men mainly in the substitution of French for Greek, and in the addition of music and art to the curriculum. The first institutions for the higher education of women were necessarily private, for, although the states had established colleges and universities for their boys, they had ignored the education of the girls and excluded them from all their schools. Therefore, I searched the Cincinnati city directories for girls’ academies. In Hall’s 1825 Cincinnati Directory, only one girls’ school was listed: the Cincinnati Female Academy of Dr. John Locke. According to Ford & Ford, the academy had been established in 1823 and “was a school of high class and became very popular” (p. 174). As of 1826, the school was located on Walnut Street between Third and Fourth (so, nearby Sarah’s primary neighborhood), but I was not able to find any specific reference to where it was located from 1823-1826 (although I would imagine probably in the same area). I thought Locke’s school must be a shoe-in for my “educated guess” until I read through Sherzer’s article, which mentions at least two other schools that allowed females during that time period. One was the Cincinnati Lancaster Seminary, though I have ruled it out because it seems to have been affiliated with the Presbyterian Church. I can’t imagine Horton Howard sending his daughter to a Presbyterian school when they were Quaker — so Quaker in fact that he could not officially condone her marriage to a non-Quaker [see Part 2, Aug. 10, 2011]. The other was Pickett’s Boarding School (or Cincinnati Female College), which, although Sherzer says the school started in 1823 and was “especially popular” (p. 10), is not listed in the 1825 directory, though it does show up in Robinson & Fairbank’s 1829 Cincinnati Directory. No address is given for the school, though the Pickett brothers’ address is Sycamore, between Fourth and Fifth — so again, right around the same area. I hoped perhaps the curriculum might help rule out one or the other — Locke’s or Picketts’ schools — but unfortunately, none of the curricular lists are explicit enough. Both of course had the typical female curriculum involving art, but it sounds like Sarah had options such as chemistry or Latin. In the sources I found, only Locke’s school explicitly mentions the availability of chemistry (Sherzer, p. 9); and only Picketts’ specifically mentions having Latin (Sherzer, p. 10; Ford & Ford, p. 174). In Locke’s school’s advertisement from 1825, a list of instructors and their disciplines is given, but that list includes neither chemistry nor Latin; of course, for that matter, it does not explicitly mention any sort of paper-based art form either, which seems odd. In the end, what matters to Sarah’s story is not so much which school she attended or even necessarily why she was there (is it just me or does it sound like Dad wanted her trained up so she could help him with his map-making?) or even why she was in Cincinnati as opposed to somewhere else (what, didn’t they have any decent girls’ schools in Columbus? )… Those things (and consequently this entire post) are mainly just “matter of interest” details. What matters is the fact that she was there…in that place…at that time…and that’s where she met Samuel Forrer, whom she married without her parents’ consent a few months later, and who would be her husband for 48 years. We have, in the Forrer-Peirce-Wood Collection, one other letter from Horton Howard to his daughter Sarah during that time frame — Dec. 11, 1825 — and its tone is much different. It would seem that Sarah’s parents had probably caught wind of her developing feelings towards Forrer by that point. I’ll share more of that later. Ford, Henry A., and Kate B. Ford. History of Cincinnati, Ohio. Cleveland: Williams & Co., 1881. Available online at Archive.org; or, find in a library. Forrer-Peirce-Wood Collection (MS-018), Dayton Metro Library, Dayton, Ohio. This collection is publicly available for research at the Dayton Metro Library, Main Library, Local History Room, 215 E. Third St., Dayton, OH 45402. Hall, Harvey. The Cincinnati Directory for 1825. Cincinnati: Samuel J. Browne, 1825. Available online from Cincinnati Public Library; or, find in a library. Robinson & Fairbank. The Cincinnati Directory for the Year 1829. [Cincinnati? ]: Whetstone & Buxton, 1829. Available online from Cincinnati Public Library; or, find in a library. Sherzer, Jane. “The Higher Education of Women in the Ohio Valley Previous to 1840,” Ohio Archaeological and Historical Quarterly 25 (1916): 1-22. Available online from the Ohio Historical Society. For more information on Sarah Howard and Samuel Forrer, contact the Dayton Metro Library, or feel free to leave a comment on this blog. When you’re working with history, you sometimes find yourself in a situation where you don’t have all the pieces of the puzzle, many times far fewer than you’d like, and so you use your brain and you do some guesswork and speculation to hopefully help you connect the dots, get from A to B, explain whatever it is you’re trying to explain. But always keep your eyes open for hard evidence that will eventually tell you that you’re barking up the wrong tree. During this investigation, lacking for any other documentary evidence (as yet), I wandered down what turned out to be a false trail myself for a while. So I was beginning to piece things together in my head: Hmm, so I know that there are later letters from Horton Howard to Sarah and Samuel addressed to “dear children” and they seem generally pleasant, so if he failed to give his blessing to their marriage, he obviously didn’t “disown” them himself or stay mad forever. And now, here I have this bit of information stating that he sided with the liberals during this religious schism in 1828, so I suppose that probably means he was one of the more, well, liberal Quakers himself. So could it stand to reason that perhaps he just went ahead and gave his “permission” for Samuel and Sarah to get married with a “devil may care” attitude towards what the rest of the congregation might think? But then again, he was one of their leaders, so that probably wouldn’t have looked very good, and maybe he was concerned about keeping up appearances, even if privately he didn’t care who she married? You can see how my brain might have been starting to implode, with all these “what ifs” swirling around and seemingly no way to confirm any them. [Written on the side:] Direct your letter to Cincinnati. So there you have it, folks: “without the consent of her much loved parents.” Mystery solved—that one, anyway. Apparently, dad said no, and they big fat did it anyway. Although it seems to have worked out all right in the end. Like I said, Horton Howard clearly wasn’t so angry that he cut off contact with them or anything. (He sent them several letters afterwards addressed to “dear children” and signed “your affectionate father.”) Heck, maybe he wasn’t really angry at all, but for the “official” record had to deny the request. Very interesting stuff, religion and politics. But hey, let’s not forget our final point of interest: There’s that name again—M. T. Williams. (Remember, he’s the man whose home Sarah was staying in when Samuel met her?) And for that matter, now that I have this second letter, who are all those other guys? Samuel sure seems to think that the fact that he knows these people and the fact that they approve of his marriage to Sarah ought to win him some brownie points with his new father-in-law. Like, “Look, Dad—er, I mean, ‘Sir’—these guys think I’m good enough for your daughter, so you should too.” So who were they? I think I may save that for Part 4. And I promise, Part 4 will be the final installment of this particular adventure. The material discussed here is from the Forrer-Peirce-Wood Collection (MS-018), which can be found at the Dayton Metro Library, Main Library, Local History Room, 215 E. Third St., Dayton, OH 45402. For more information on the collection, contact the library, or feel free to leave a comment on this blog. Hello! I'm an archivist in Dayton, Ohio. I write about history, archives, and/or library-related topics. Please also check out the blog posts I write for Wright State University Special Collections & Archives, where I work.